Someone has broken into Remy's house and stolen his notebook, so he gathers his Critter Crew to try to find it. The notebook where his grandfather kept sketches is all he has left of his family, who were scattered after their home was torn down. Buttercup, a cat new to the neighborhood, tries to help, but is rather crafty and mean and gets Remy and his crew into some trouble. The group ends up in the sewers, where they are almost eaten by an evil alligator, but Buttercup proves he is on their side and saves the day. The investigation continues, with Remy visiting a local cafe and getting some clues about an animal in a hoodie who was seen skulking around his house. When Remy finally locates the mysterious creature, secrets about their shared past are revealed. 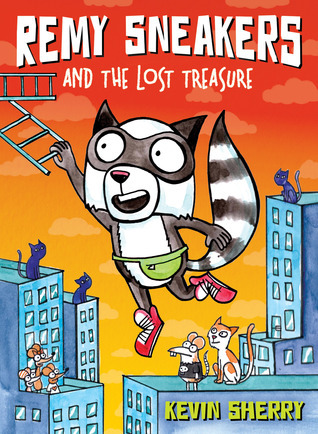 This beginning chapter book graphic novel has a fun cast of characters, a lot of goofy action and adventure, and a mystery that young readers will find to be intriguing. The black and white illustrations support the larger format text, making this a good choice for beginning or struggling readers. Remy's fanny pack collection, his love of drawing his surroundings in order to bring him closer to his missing family, and his loyal and supportive Critter Crew are all endearing touches. Fans of LaReau's Infamous Ratsos, Eaton's Flying Beaver Brothers, and even Krosoczka's Platypus Police Squad will want to go along with Remy as he follows the mysterious creature in the hoodie in order to retrieve what is rightfully his!